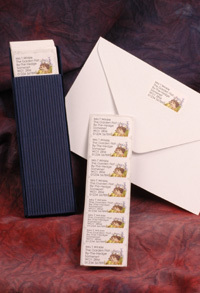 Countryside-Direct Personalised Stationery is that little bit different. Notepaper, Visiting Cards, Correspondence Cards and Self-Adhesive Address Labels are all decorated with Sheila's lovely botanical or wildlife designs. A utility item is immediately transformed into a beautiful gift object. 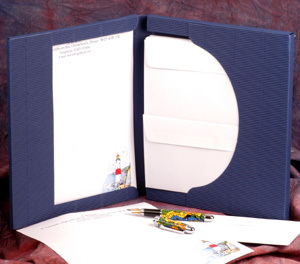 Everything is printed with the latest digital printing technology to produce crystal sharp images on high quality paper and card and supplied with heavyweight envelopes where appropriate. To complete the picture, all items are packed in modern, dark blue corrugated packaging. We can post these items directly to your friend or relative passing on your greetings if required. Help revive a classic Victorian tradition by carrying a visiting card when travelling. They make exchanging addresses, telephone and even E-mail details pleasurable and simple. Credit Card sized at 86x54mm (3.4"x2.1"), they are perfect for storing in your purse or wallet, or even the case in which you will receive the cards. 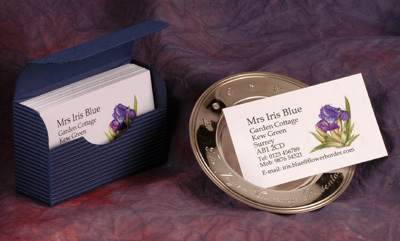 100 visiting cards in the wallet cost just £14.50, plus postage. 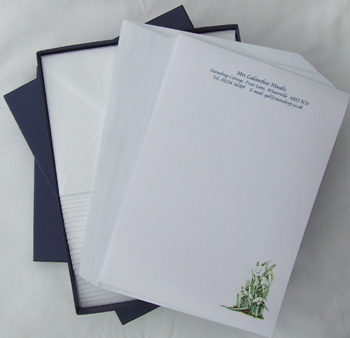 You will receive 40 sheets of high quality, printed notepaper. 265x210mm (10.4"x8.25") with your chosen design and details, plus 40 envelopes and 10 plain continuation sheets for only £21.50 plus postage. 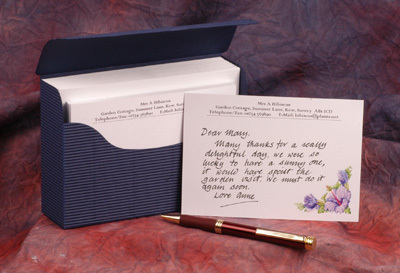 The attractive and sturdy packaging, makes this stationery the perfect gift for friends and relatives. 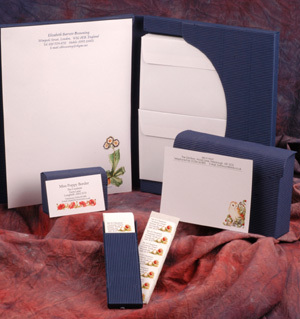 The tall flower designs are particularly attractive on this notepaper. 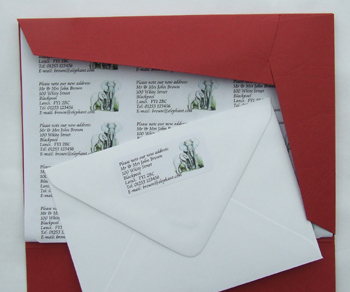 However, you may choose from a very wide range of designs when ordering; to really personalise your correspondence. Also available are 210 double sized labels 64 x 28 mm ( 2.4" x 1.1" ) at £9.95 These are useful if more information needs to be printed e.g email, mobile phone, greetings, changed address etc.